Signs of the Times highlights Cullman's wealth of historic markers. HOLLY POND – The Holly Pond Cemetery is located one-half mile northwest of Holly Pond High School on County Road 1669 in the town of Holly Pond. On April 19, 2015 the Holly Pond Historical Society unveiled this beautiful Holly Pond Cemetery historical marker near the main entrance. Marked by an antique arch, the Holly Pond Cemetery encompasses 10 acres and a chapel built in 1975. The site was chosen to replace the burial ground in the center of town and make room for the town to grow. The first acre was deeded to the deacons of the Baptist Church and the stewards of the Methodist Church. The first burial was a child, W.R. Hendrix, on 15 August 1894. Interred here are many of the early settlers who came here after the Civil War, including veterans of that conflict. The cemetery has been maintained by the Holly Pond Homemakers Club since 1949. 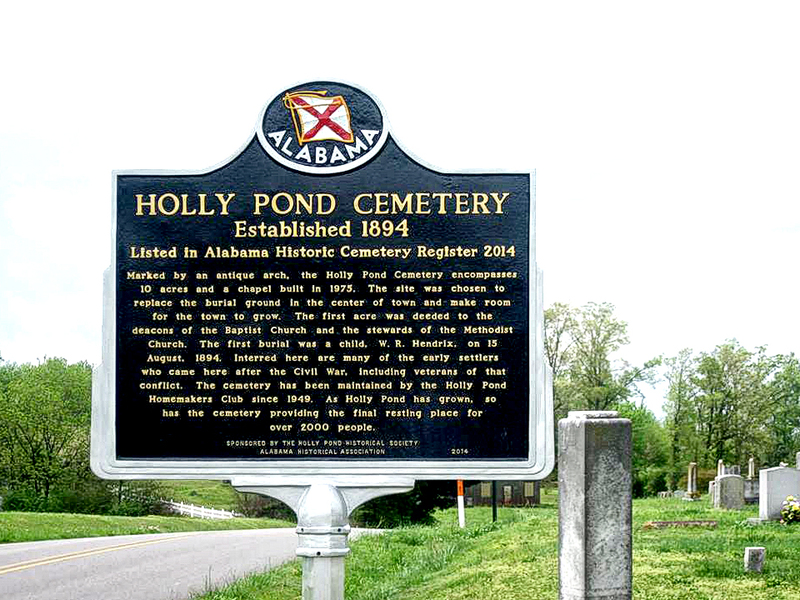 As Holly Pond has grown, so has the cemetery providing the final resting place for over 1000 people.